When Jennifer Stevens won the singles and doubles titles at the Claycourts in July, people were wondering where she came from. The fact is that Jennifer has been a top-ranked fixture in USTA junior tennis for five years, but she has never had a summer like this before. What a summer it has been. Jennifer Stevens won the singles title and was a finalist in the doubles (with Christina Liles) at the Bush Florida Open before sweeping the USTA Super National Clay Courts. At the Hardcourts, she made it to the singles semis and the double quarterfinals. Even though this summer has been her best group of wins, Jennifer has a number of trophies on her shelves. In 2002, Jennifer won the doubles title and reached the singles semifinals at the USTA International Winter Championships. 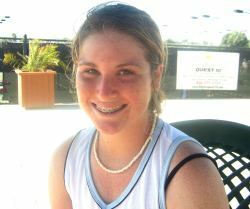 During 2001 she was a singles semifinalist at the Maureen Connolly Brinker Championships, she made the doubles finals of the Super National Claycourts (12s), was a third place singles finisher and doubles finalist at the Super National Hardcourts (12s), and won the doubles title at the Super National Spring Championships. Fourteen year old Jennifer is currently ranked five in the Girls' 16s. She had earned the number one ranking in the 12s last year before making a quick tour through the 14s and landing at the top of the 16s this year. I sat down with Jennifer at the USTA Super National Hard Court Championships in San Diego. As amazing as her wins have been this summer, they have in no way shaped her life. Jennifer is friendly, though slightly shy, girl who considers school her number one priority and having fun a close second. While tennis is certainly important to her, it does not define her.